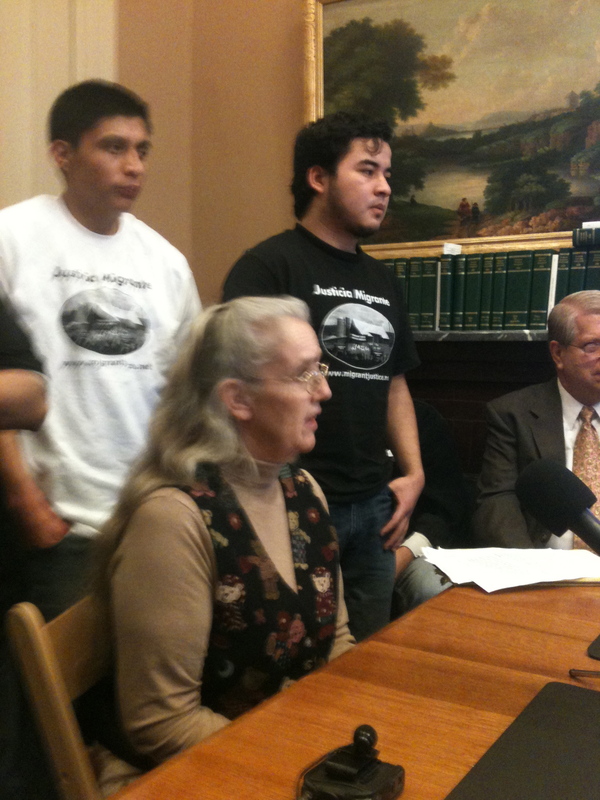 Wednesday, February 22, VT State House-- A group of 10 Vermont farmworkers, farmers and community supporters forced the VT Senate Agricultural Committee to find a bigger room to hear testimonies in support of new legislation (S-238) that the ad hoc coalition hopes would allow noncitizen Vermont community members to obtain Vermont issued forms of identification and gain access to State of Vermont rights and programs. In the standing room only space, UVM's Dan Baker, who helps run the Vermonter Poll opened, "In 2011 72% of the more than 600 Vermonters we surveyed supported the adoption of bias-free policing programs. For the past two years we have surveyed more than 600 Vermonters about their opinion on the impact of undocumented farmworkers in our state. The majority of people believe that these workers are helping to keep our farms in business and that they are not taking jobs away from Vermonters." Farm Worker leader Danilo Lopez, was up next donning a T-Shirt reading 'Migrant Justice', and was surrounded by farm workers who had skipped sleep after working all night milking shifts in Vermont's iconic dairy farms. Lopez then shared, “I was injured on the job. I badly bruised my ribs, hurt my wrist and ankle after a bull kicked me. I asked my employer to take me to the hospital but they said to wait until tomorrow. I feared calling an ambulance without any ID at the time. If I had a state-issued ID or a driver’s license I wouldn't have had to wait 24 hours in pain to access our health care system. This is a human rights issue." Migrant Justice then presented improvement to S-238. They shared that transportation in rural state is a fundamental human need and thus proposed that the bill create a path for noncitizen Vermonters to access both State issued ID and drivers' licenses. Lopez explained, "We live here, we work here, we contribute to Vermont's economy and working landscapes and we pay taxes. We ask nothing more than to be treated as equals in Vermont." Migrant Justice has talked with some members in law enforcement who suggest such an ID could be a good thing for the Public Safety of all Vermonters allowing migrant workers to feel more comfortable accessing police and other law enforcement agencies. Two dairy farmers testified including Rob Hunt and Phyllis Bowdish, from Addison County who explained, ". Everyone needs to feel appreciated and I am here to show, not only to our employees, but to all the other migrant farm workers in Vermont that they deserve to be recognized for their contribution to Vermont agriculture.” Tim Buskey, representing the Vermont Farm Bureau added, "For us its simple. The federal government is failing to enact immigration reform. We in VT have a right and a responsibility to make sure all our community members are treated fairly. Lets make S-238 do that." There will be additional hearings on the bill next week in the Senate Agricultural Committee.